The booklet, commercially created as a photo book from www.mypublisher.com/minibook, was titled "Love Everywhere" and included Scripture about love as well as photographs of hearts seen in nature. Our hope is that through its use, families and other congregation members were challenged to find love everywhere in the Lenten season. With Lent approaching and a focus of the season being on prayer, we sought ways to assist families in their communal prayer lives while engaging them in their homes at the times that would work best with their own schedules. Using ideas gleaned from http://flamecreativekids.blogspot.co.uk/, we created prayer packets. Assembled as several ideas of ways to pray together with all of the necessary supplies packaged in large plastic zipper bags, families were encouraged to take a packet, use it, and then return it to take another packet that included different prayer practices. Once one was returned, it was checked for supplies, replenished, if needed, and placed out for another family to use. These packets will be able to be used year after year in our congregation. Springing from this web posting, families were presented with a kit to make their own Advent Prayer Box. 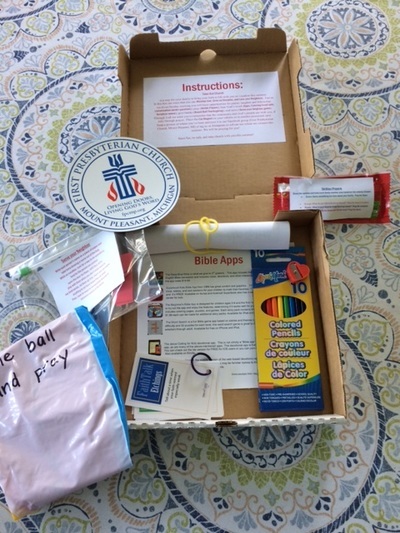 We made adjustments to the prayers and to the illustrations but provided the box, the printouts, directions, and small decorative items (gift bows, ribbon, etc.). ​Because families have been provided with Advent activities for the last several years, our goal was not to overwhelm them, but, instead, to provide a supplement to practices that may already be occurring in the home (Advent wreaths, Advent trees, etc.). Ideas for ways to use the prayers included on the prayer box were a part of the kit. Although Thanksgiving is not an official part of the church liturgical year, the holiday can certainly be holy as we pause to give thanks to God. Since this practice is often overshadowed by large meals and football games, families were provided a simple cloth table runner for use on their Thanksgiving tables. Also included in the kit was a fabric marker and a model for a short Thanksgiving service to take place during the mealtime. During the service there was a time devoted to having the family members or meal participants add words of gratitude to the table runner using the marker. ​Families are encouraged to use this table runner year after year, looking back at the things for which they were grateful in previous years. Using an idea found at https://gracefilledchaos.wordpress.com/2015/05/30/take-out-church/ we offered Take Out Church boxes to families of the church for use during the summer months when worship attendance may not be as regular. The idea is to provide supplies for families to use in times of worship together outside of the church building. Packaged in a pizza box, the kit fits easily under the seat of a car or tucked in a beach bag. 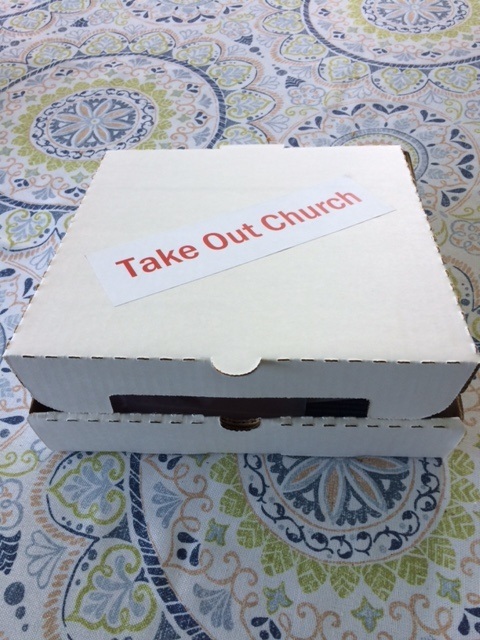 Our congregation used several of the ideas from the original post but also used some of our own activities. Focusing on the wind of the Holy Spirit that arrived on the day of Pentecost, kites kits were provided for each child of the church. These kits contained a nylon kite with a colorful tail, a set of crayons, and instructions for families. Families were encouraged to look up the biblical account, talk about the symbols and significance of the day, and color the kites using those symbols. While Pentecost on this day fell on Memorial Day Weekend, the weather in our town lent itself to flame-filled kites in the air. During the season of Lent, families with children were invited to engage in a practice of adding something rather than giving something up. They were given the materials to create a cross out of salt dough that holds six purple candles, one for each Sunday of Lent. Using the same idea as an Advent Wreath, families gather together each Sunday of Lent to light a candle, read the lectionary Scripture, and talk together about a challenge for the week. Scripture and challenge cards were provided with the weekly challenges actions based loosely on the Scripture for the week. Families were also encouraged to post the week's challenge in a visible spot (refrigerator, bathroom mirror, or the front door) and use it to spark discussion throughout the week. We also didn't want to forget about our families who do not have children or those who consist primarily of adults. As a result, challenge cards were also created for these families, with the challenges still linked to the lectionary passage for Sunday but with a little more of a "challenge." As Epiphany approached, families were invited to engage in a service project together. Specifically to give to the babies in our community who are in need. This coincided with the community Infant Pantry that is housed in our church building. One family gave the gift of time in creating fleece tie blanket kits to be distributed to the families of the congregation. 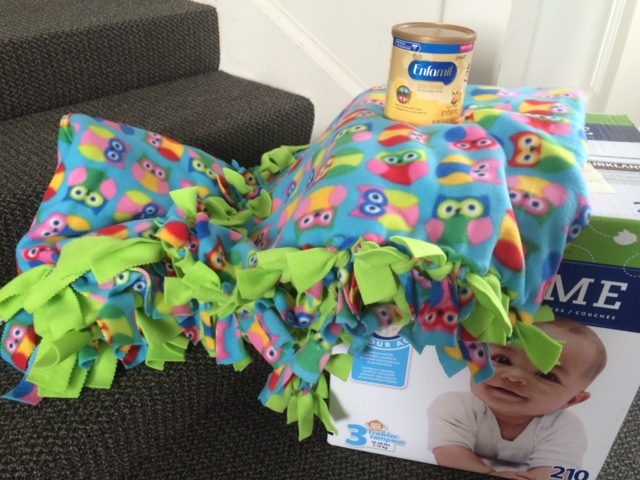 These kits included two 54"x60" pieces of fleece (one with a child-friendly print and the other a coordinated solid color) and instructions for creating a simple no-sew blanket. Church families picked up the kits prior to Epiphany. They were encouraged to read the Epiphany account in Matthew2:1-12, talk together about the events of the story and how news about Jesus spread, connect the ways we can give to others by following the teachings that baby grew up to teach, and use the instructions (with photos) to cut the fringes and tie the two pieces of fleece together. Additional instructions were provided for other church members/attendees who wanted to make and donate a blanket. Completed blankets were collected in the wagon that is a regular part of our congregation's offering and is the place for donations to the Infant Pantry. Blankets were then distributed to families in need of the extra warmth along with necessary diapers, formula, and food. Since families were continuing to use the Advent Tree during the Advent season, we did not want to overwhelm them during an already hectic season. Instead, families were given an opportunity to slow down by being presented with a storybook on the Third Sunday of Advent, following the children's Christmas pageant. 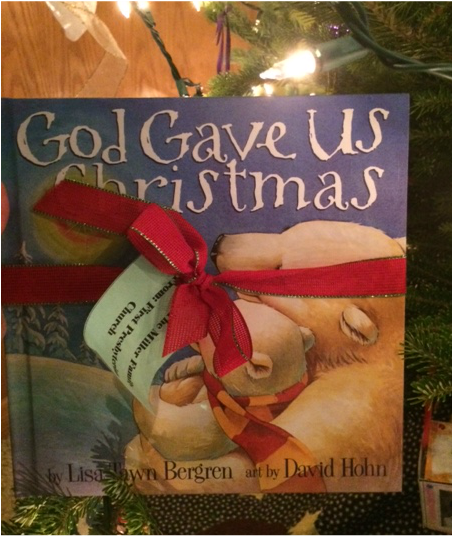 The book was chosen because of its description of the season rather than its retelling of the biblical story. This particular book also connected the families to the book that was given for Easter in the spring - the same author and characters. The Advent Tree actually began our congregation's foray into providing "faith kits" for families with children last Advent. This was before we had received, or even applied for, the Mariner's Family Ministry Grant through the PC(USA). The reactions were so positive that we sought out the grant to continue such actions throughout the liturgical year. This year we will be adding to the practice (more on that in a future post) along with providing more permanent instructions of the use of the Advent Tree to the families who received theirs last year. Here are the basics. As a form of Advent Calendar, each family was provided a prelit tabletop Christmas tree; 25 ornaments of various shape, type, and color; a permanent marker; and a variety of craft supplies. Also included in this kit was a description of the faith practice, ways to use it in the family, and a list of the days of Advent along with a Scripture reference. This is not just a Christmas tree that families decorate in December. Instead, each day the families use their time together to create an ornament that shows a name or descriptor of Jesus. All of these are taken from Scripture, one for each day of Advent. Together, families are invited to learn more about Christ throughout the season of Advent. Why would Jesus be given this name? What about Jesus caused others to describe him in this way? By Christmas Day, each family had a small tree with 25 names of Jesus as ornaments and had gotten to know the person of Christ that much deeper. Martha Hubbard Miller is a wife, mother, daughter, sister, friend, educator, and child of God. Sharing faith and the story of God's people is a passion and shows through in her part-time ministry of discipleship and spiritual formation at First Presbyterian Church, Mt. Pleasant, MI.